Lots of photos to post today, so let’s get started! Yesterday on the way to work/school, I saw a whole bunch of ducks in a bottom. I wouldn’t say it was exactly flooded, but it was less than 100 yards from the Merrimack River. I think the bottom filled with water from the rain, not from the river, so I’m not sure I can call it flood water. Anyhow, we were running late, so there was no time to stop and take photos. We were not exactly running early today either, but I decided we’d stop anyhow. 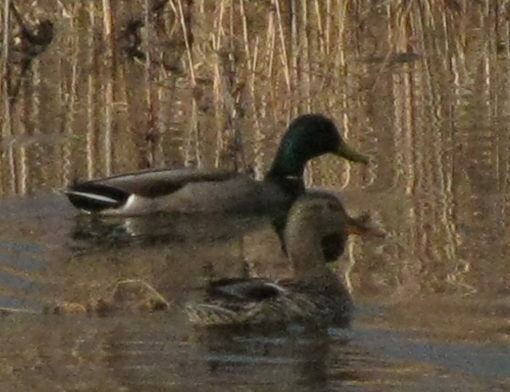 I got this shot of a pair of mallards. Again, I had the zoom maxed out, and the graininess pretty much proves that. When I got home, I went out to the big rock to play with the CHDK motion detection software I had loaded onto my camera. As I was standing there fooling with it, screwing the tripod into the camera, a chickadee landed not five feet from where I was standing. I looked at it while I finished screwing in the tripod. Then I slowly raised the camera and got off three shots. This one came out the best, and I am pretty well pleased with it. I can’t expect them to always do that, and I’d like to get pictures of other species as well, so I went ahead and set up the camera in the motion-detect mode. This is still a work in progress. The birds do not always land right in the center of the picture, but one chickadee did land right on top of the camera once. Luckily (or maybe it wasn’t luck), the camera was sitting pretty solidly on the rock and didn’t tumble over. 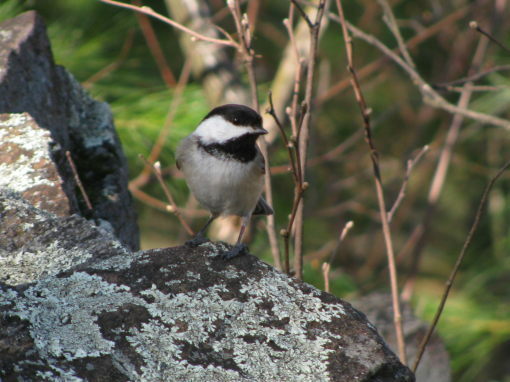 Also… chickadees are pretty light. Speaking of light… it was headed toward evening and the sun was out, but not strong. Also, it had gone behind the trees so the rock studio was in the shade. So I wasn’t able to use the settings I wanted on the camera, and several of the shots were motion-blurred. 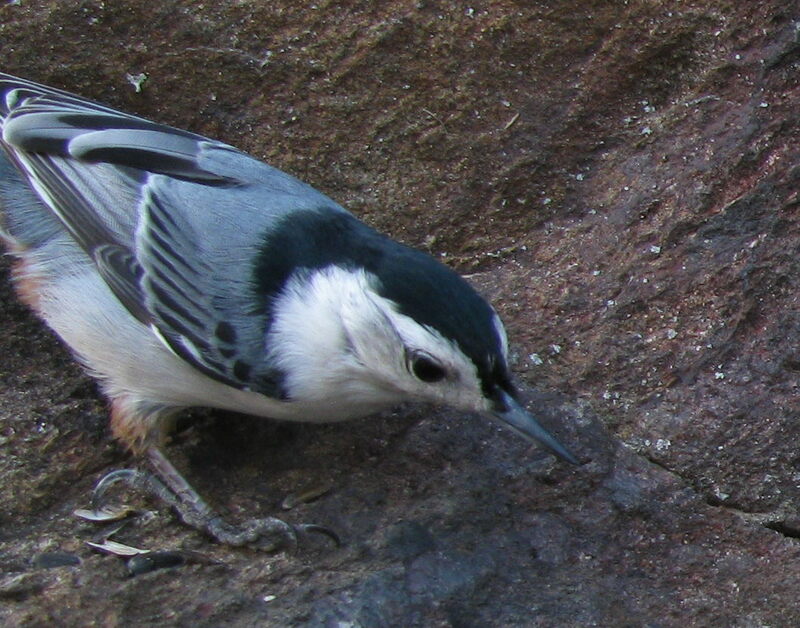 The nuthatch eventually made its way out, but (s)he never did land with her whole body in the area framed by the camera. It was always off to the side. A little cropping, and it’s not half bad. But there’s still room for improvement here. OK, it’s pretty obvious here who she selected now. I know some of my relatives will be delighted about this, and others will be abhorred. 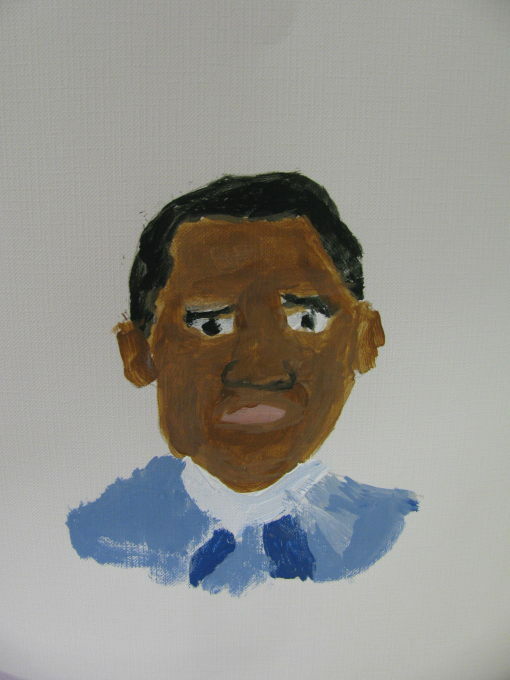 But I guess art is supposed to solicit emotion, and by that measure, this is bound to be a success! They had also each put together a PowerPoint (well… OpenOffice Impress) presentation. Those all looked great, but with ten copies of Impress running on my Linux server all at the same time, it was struggling to keep up. Not sure what the issue was. I “cheated” and opened up a terminal window to do some diagnostics. I’ll spare you the details, but I’m not exactly sure what I need to do about this. But at least I know how to bring the server to its knees now, and with that recipe, I should be able to recreate the problem and address it… not during a school presentation.